This is a Travertine cleaning project we carried out on a 10-year-old Travertine tile floor in Abbots Bromley, Staffordshire. 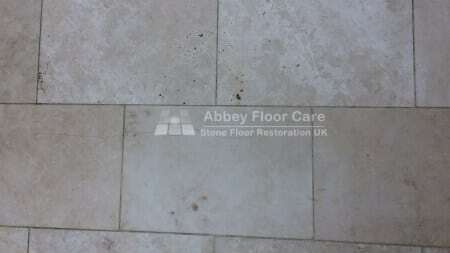 There were around 120 square metres of travertine tiles installed in an Orangery, kitchen and dining area. The tiles in the kitchen diner area had suffered from typical issues suffered by honed and filled Travertine with a family plus 3 dogs. The orangery was a later installation and the tiles were much cleaner, with fewer holes. However, there were a number of long hairline cracks and smaller but more apparent cracks at the edges of the floor. 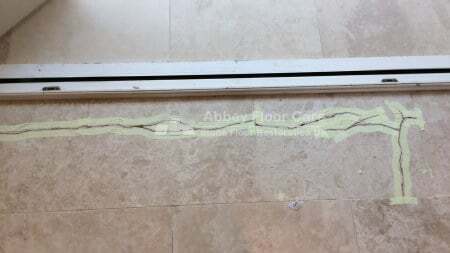 After discussing the situation with the homeowner we decided to open up and fill the large cracks on the edges of the floor and leave the hairline cracks. I started the Travertine cleaning by deep cleaning the tiles and grout using a rotary floor machine, honing powder and cleaning chemicals. The floor was then left overnight to dry ready for filling with hard filler. I filled around 200 large holes ranging from 1omm diameter to 100mm diameter with hard jasmine filler. I used a diamond grinding wheel to open the large cracks ready for filling with the hard filler. This picture shows travertine tile repair in progress. The left hand of the image shows the crack opened with a diamond grinding wheel. The right hand side shows the filler ready for smoothing. A number of tiles with cracks were heavily filled. At least 50% of the tiles was filler and I was concerned that the cracks may have weakened the surrounding area. So before filling the tiles with the jasmine filler, I injected a free flowing epoxy resin deep into the cracks in an attempt to strengthen the tile and stop more cracks appearing. As the picture below show, I used adhesive tape around the cracks. The tape makes it easier and quicker to grind the filler smooth with the travertine. The key to successful smoothing of the filler is to get the filler smooth without damaging the surrounding tile. 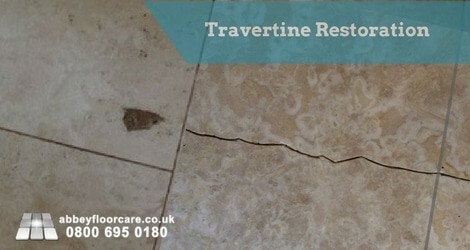 If you do not take care travertine, aggressive honing will reveal holes around the repair that will need to be filled in. Once all of the cracks and holes were filled and smoothed, I honed the floor with 400 grit diamond tools to smooth areas roughened by traffic. 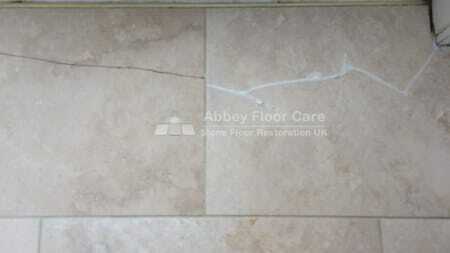 The honing element of the travertine cleaning gives the floor an even appearance. The short video below shows the honing process. After honing the floor, I filled the smaller holes with a jasmine coloured grout. I had to grout fill all of the tiles in the kitchen area. The tiles in the orangery had fewer holes and the picture below shows the grout filler. After grout filling, I removed all of the grout haze and the floor was ready for sealing. A new honed and filled travertine floor is usually sealed with an impregnating sealer because the fillers have a similar sheen to the honed travertine. However, the grout filler has a matt finish, so I recommended the best travertine sealer to be a water based Acrylic surface sealer. The Travertine sealer gave the floor a beautiful, low sheen finish. The key to cleaning Travertine tiles is to use the right cleaning products and cleaning equipment. 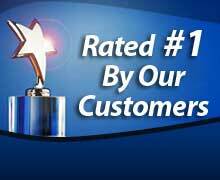 So I recommended a microfiber mopping system the correct Travertine cleaner. The Travertine cleaner is ph neutral, so it will not soften and damage the sealer. The Travertine cleaner also contains a small amount of polymer to help maintain the sealer. 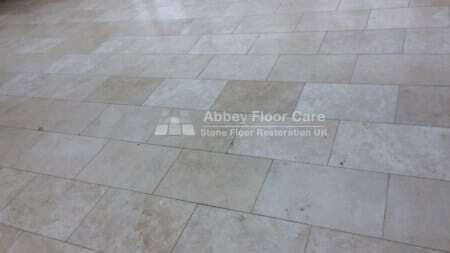 If you would like your Travertine floor cleaned and restored to its original finish, please complete our simple contact form for a free, no-obligation quotation.